The Altar of Heaven (天壇) at the Temple of Heaven complex in Beijing, China is the most holy of Beijing's imperial temples. It is also called the Hall of Prayer for Good Harvests, the largest building in the Temple of Heaven. The Temple of Heaven complex, now called the Temple of Heaven Park (天坛公园), is regarded as "a masterpiece of architecture and landscape design." The Temple of Heaven has also been listed as World Cultural Heritage by UNESCO. Located in the southeastern part of central Beijing, the complex was visited by the emperors of the Ming and Qing dynasties for annual ceremonies of prayer to heaven for good harvest. The temple complex was constructed from 1406 to 1420 during the reign of the Yongle Emperor, who built the Forbidden City in Beijing. The complex was extended and renamed Temple of Heaven during the reign of the Jiajing Emperor in the 16th century. It has also been regarded as a Taoist temple since then. The Temple of Heaven was renovated in the 18th century under the Qianlong Emperor. The temple was occupied by the Anglo-French Alliance during the Second Opium War. In 1900, during the Boxer Rebellion, the Eight Nation Alliance occupied the temple complex and turned it into the force's temporary command in Beijing. The occupation desecrated the temple and resulted in serious damage to the building complex and the garden. Robberies of temple artifacts by the Alliance were also reported. With the demise of the Qing Empire, the temple complex was left un-managed. The neglect of the temple complex led to the collapse of several halls in the following years. In 1914, Yuan Shikai, then president of the Republic of China, performed a Ming prayer ceremony at the temple, as part of an effort to have himself declared emperor of China. In 1918 the temple was turned into the Temple of Heaven Park (天坛公园) and for the first time open to the public. 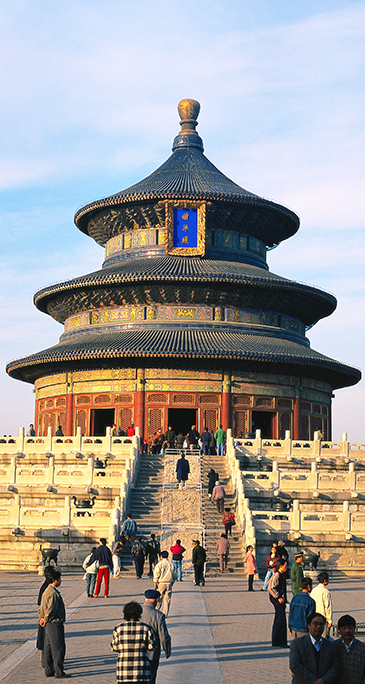 The Temple of Heaven was listed as a UNESCO World Heritage Site in 1998. It was described as "a masterpiece of architecture and landscape design, which simply and graphically illustrates a cosmogony of great importance for the evolution of one of the world’s great civilizations. The symbolic layout and design of the Temple of Heaven had a profound influence on architecture and planning in the Far East over many centuries. In ancient China, the emperor of China was regarded as the Son of Heaven, who administered earthly matters on behalf of, and representing, heavenly authority. The temple was built for the ceremonies mostly comprising prayers for good harvests. Twice a year the Emperor and all his retinue would move from the Forbidden City through Beijing to encamp within the complex, wearing special robes and abstaining from eating meat. No ordinary Chinese was allowed to view this procession or the following ceremony. In the temple complex the Emperor would personally pray to Heaven for good harvests.